The Station is keen to recruit young people aged between 13 and 18 years of age to take part in this rewarding scheme. 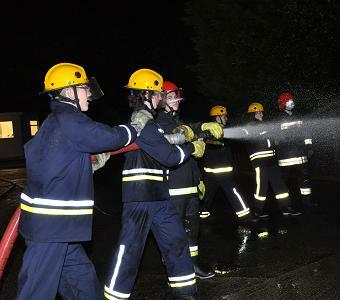 Cadets need to attend meetings every Wednesday from 6-8pm at the Albert Road Fire Station and they don’t need to live in Bollington to be part of the unit.Apart from drill nights cadets also take part in additional activities at weekends and during the school holidays, which include residential stays, local camps and national camp trips. They are also involved in fundraising activities for the Firefighters Charity. 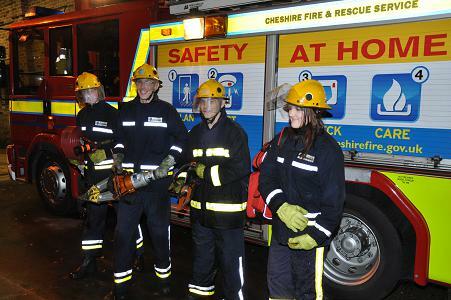 All Cheshire Fire Cadets get a free uniform and also a fire kit, which is similar to that worn by firefighters, and the evenings are free to attend, but there may be a small charge towards refreshments.Councillor David Topping, Chairman of Cheshire Fire Authority said: “The cadet scheme is a fantastic initiative and enables young people to make a real difference to their local community by supporting the work of the firefighters. Anyone interested should go along on any Wednesday evening from 6-8pm, contact the Youth Engagement Office on 01606-868427. For more information visit www.cheshirefire.gov.uk. 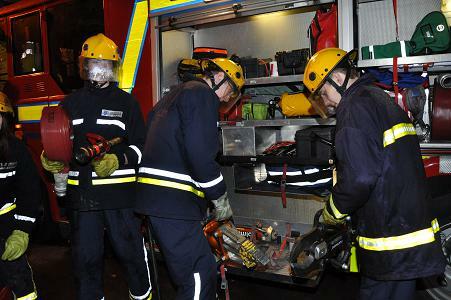 The Bollington cadets pictured (left) in front of the local engine. They get training in the use of the tools carried on board. Girls as well as boys can join the cadets. Safe ladder use (above) is an important skill for the modern fireman. Checking out the modern sophisticated power tools available from the lockers around the fire engine, usually specially designed and developed for fire service use. 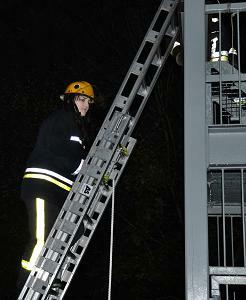 All pictures taken at Bollington Fire Station on a cadet training evening.